50 lb. adjustable dumbbells are a great addition to your home fitness and exercise equipment. The Bayou Fitness Pair of 50 lb. 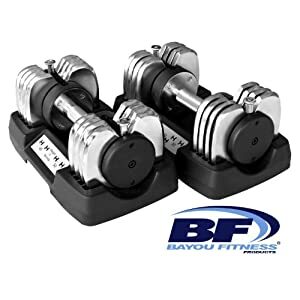 Adjustable Dumbbells BF-0250 are a nice-looking chrome and are easily adjustable from 10 lbs. - 50 lbs. (They are great if you are working out and sharing equipment with a nice lady.) The handles weigh 10 lbs. and each plate is 5 lbs. The two things I like most about using these 50 lb. adjustable dumbbells is that they have a secure metal locking mechanism...NOT plastic like a lot of them. And, they also have knurled grip handles, so they feel just like the ones at a gym. They come with two heavy-duty plastic storage trays. The Bayou Fitness 50 lb. dumbbells are study, easy to change, and solid. I have no fear doing Military Presses with them.